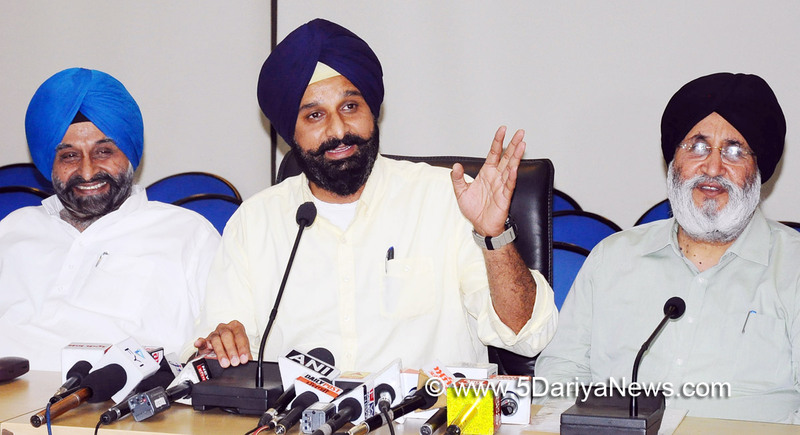 Former minister and Shiromani Akali Dal (SAD) general secretary Bikram Majithia today demanded registration of a criminal case against Local Bodies minister Navjot Sidhu and his wife Mrs Navjot Sidhu as well as their accomplices for releasing the report of the STF which was sealed by the Punjab and Haryana high court.Addressing newsmen here, the former minister showed a video of a press conference done by the Sidhu couple and asked in what capacity Mrs Sidhu was holding the Sidhu team’s false, fabricated and procured report. He also asked in what capacity Sidhu had access to the report. “There is no way a sealed cover report which was resealed on the directions of the high court be with a lady who does not hold any official position in the government and a man who is in no capacity to have access to this document. Only registration of a case and a thorough investigation can unearth the larger conspiracy as well as the people behind it”, he said adding as far as he was concerned the facts were amply clear. “Sidhu and Sons have come together to target and tarnish my reputation”. Terming the leak of the STF report as the “gravest of criminal contempt”, the Akali leader said the entire affair smacked of the worst kind of conspiracy and an attempt to make a mockery of the judicial process. “It is unheard that a report sealed on the orders of the high court has found its way into the hands of unauthorized persons with vested interests”.Speaking about STF chief Harpreet Sidhu, the former minister said he wanted to thank the officer for admitted that they were estranged cousins. He also reminded the officer that he could not get away with a general statement that he had acted as per law. “There is a section on ethics and propriety also. You should tell whether it applies to you or you are a law upon yourself”.Stating that Harpreet Sidhu and he were directly related through his paternal aunt who was Sidhu’s maternal aunt, Mr Majithia said the STF chief should tell why he was trying to settle personal scores with him. “A conspiracy was hatched after five years to settle scores with the Majithia family”.The former minister said the STF chief should also clarify as to what were the reasons for “our estrangement”. He said the officer should also tell that if there was no collusion how seals of the report were broken and how did it reach the Sidhu couple.Mr Majtihia said all players in this drama also needed to clarify as to what was the urgency, desperation or personal agenda to release a report which was being monitored by the high court and on which the government was to submit a report after due perusal.